Tourist History is a tough act to follow. Indie-rock trio Two Door Cinema Club’s 2010 debut had all the makings of a pop-perfect album; each song was a pleasant combination of clear, upbeat vocals and irresistible rhythms. Now the band is back with Beacon, and the album is anything but a sophomore slump. Where Tourist History’s every song was overflowing with hyper energy, Beacon takes the time to slow down. Tracks like the opener, “New Year,” still sport the band’s cheery tone, but have a new element of sweetness. “If you think of me, I will think of you,” sings Alex Trimble shyly. On “Sun,” he is suddenly soft and uncertain. “Ocean blue, what have I done to you?” he begins, leading into the album’s slowest track. The tone of each song is often steady, but not always the same in its approach; Trimble isn’t afraid to play with his words. In “Wake Up,” he stretches his words until each syllable collapses into the next. Every breath feels confident and controlled. Beacon gets back on its feet with its quicker tunes, found in the ever-charming “Someday” and the fast-tempoed “Sleep Alone.” “Someday” is a hard track to skip over. It’s repetitive in nature—almost to a fault—but its melody is intricate enough to keep your attention. “Sleep Alone” is another track that’s pushed along more by its instrumental sound than its vocals; Trimble’s voice is as appealing as ever, but it’s often bowled over by the background noise. When it does come through, “Sleep Alone”’s vocals feel like a snug fit for the song’s mood. Beacon isn’t a step up from Tourist History, but rather a brother to it. The band returns with tunes that can operate as low-volume background noise or pumped-up danceable beats. There’s very little progression or change in their sound, but that doesn’t necessarily have to be a bad thing. Fans that loved Tourist History, prepare your mp3 player; this will be your favorite album. 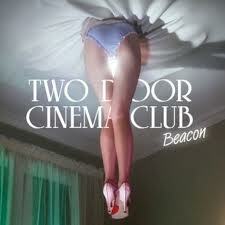 But if you haven’t already fallen for TDCC’s dance-ready, bright-voiced Irishmen, you won’t find love here.